Seinfeld has begun streaming on Hulu, but that cash windfall has not stopped Jerry Seinfeld from working on his current show, Comedians in Cars Getting Coffee. This week’s guest was Trevor Noah, the South African-born comedian who is becoming known as “the guy who is replacing Jon Stewart.” This is a chance to get acquainted with Noah before he takes over as host of The Daily Show. Was it a good impression or a bad one? Read on to find out. WARNING: Full spoilers below. Watch the episode first, please! For the first time this season, I wasn’t completely familiar with a guest. I watch The Daily Show from time to time, but have gone away from Comedy Central’s late-night programming since Stephen Colbert left late last year. I knew who Noah was, but more for his Twitter kerfuffle in March. People called for Noah to lose his job, but he has survived as Jon Stewart’s reign on late-night cable comes to an end. 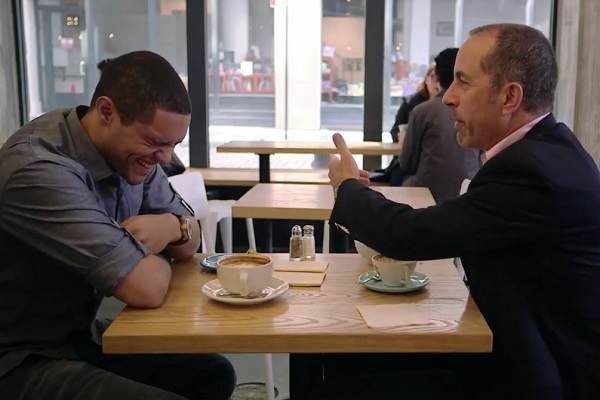 His appearance on Comedians in Cars Getting Coffee is a great “Episode 0” moment for fans of comedy to get acquainted with Noah’s style and timing. Starting off with the car, Jerry Seinfeld picked out a great 1985 Ferrari that fits perfectly with who Trevor Noah is and who he is becoming. The car is going to elicit stares and jealousy, and that’s exactly what has been happening to Noah over the last few months. The conversation started with Noah’s early forays into stand-up comedy. He mentioned that after doing a full set, he would bounce around to different clubs to keep telling jokes and improve his craft. Seinfeld asked him, “Where did you get that incredible work ethic?” “From being poor,” Noah replied. Little did I know this would be the first of many jokes about growing up in South Africa as Apartheid was nearing its end. Aside from Noah’s life, the pair talked about the skeleton of comedy. Both men look at comedy (and, to a lesser perspective, America) with the same lens, which made it easy for them to bounce jokes off of each other. They were equal opportunity, going from Nelson Mandela to Jewish mothers to Johannesburg to the Dumbo neighborhood in Brooklyn. I laughed at every single joke on the drive and imagine that this is similar to how a writers’ room works on a good sitcom, with the actual conversation making the jokes funnier. Once Noah and Seinfeld sat down for coffee, the host asked if they could go and perform together in South Africa. Noah compared it to a colonizer with a gun, making the point that he doesn’t actually have a choice in an offer like that one. The guest mentioned how great going on a Safari would be, and Seinfeld mentioned that his wife would enjoy it. In a predictable yet still funny line, he went on to say that his favorite part of the trip would be the Jeep. Afterward, Noah explained some cultural differences in stand-up comedy between South Africa and England, focusing on heckling, before the conversation returned to Noah’s impressive drive and passion for comedy. As Seinfeld put it, “Despite your mixed ethnic heritage, your comedic heritage is very pure bred.” I hope Noah has taken that compliment to heart. As the coffee shop discussion continued, I really enjoyed the next set of topics. First, there was a comparison of how popular Americans think our football is, but then the realization that it can’t hold a candle to the worldwide popularity of soccer. It flowed nicely into a conversation about how we digest other cultures, both through the idea that the members of each country’s World Cup team look like they are from that country and then how Noah thought of China as the iPhone maker before anything else about that country. This is where comedy is at its best, with jokes that stop just short of being offensive and getting people in trouble. For the first time in six seasons of Comedians in Cars Getting Coffee, a guest offered to pay the bill. Seinfeld and Noah argued over who should pay, but once the host realized he forgot his wallet, the guest had the opportunity to pick up the tab. At this point, there was still a lot of time left on the video, so I assumed either the drive would take a while or there would be a second location. The former won out, as they drove through Queens and Noah mentioned that he learned how Flushing was in Queens the same way I did, from watching The Nanny. By the end of the episode, Apartheid was the big topic. Seinfeld’s mind really was blown by the idea of government-sanctioned segregation. They talked about specifics and Noah talked about his life growing up before Apartheid ended. As the guest put it, “When you look now, you go, ‘How did that craziness happen?’ It doesn’t make sense.” There’s a saying that comedy is tragedy plus time, and that applies strongly to this topic. Both Noah and Seinfeld made jokes about Apartheid and its ending in 1994. The final few minutes of the episode were devoted to The Daily Show. First, they argued over whether or not Jon Stewart is really getting out at the right time. Then, Noah recalled when he found out that he would become Stewart’s replacement. Seinfeld knew who Noah was before his Comedy Central breakout, and Noah gives the host credit where credit is due. The episode ended with the duo attending a Mets game, likely because they wanted to witness the comedic spectacle that is Bartolo Colon hitting.